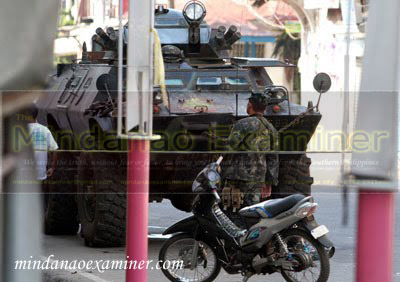 ZAMBOANGA CITY (Mindanao Examiner / Oct. 18, 2011) – Two government soldiers were killed and six others wounded in fierce clashes Tuesday in the southern Philippine province of Basilan, officials told the Mindanao Examiner. Officials said the fighting erupted in the town of Al-Barka, a known stronghold of Muslim rebels, but details of the gun battle were not immediately available. “Two soldiers were killed and six others are wounded in the fighting,” said Army Lieutenant Colonel Randolph Cabangbang, a spokesman for the Western Mindanao Command in nearby Zamboanga City.. He said the slain soldiers and the wounded were airlifted to Zamboanga City. The clash broke out at dawn, but it was unknown whether the soldiers were fighting the Abu Sayyaf group or the larger Moro Islamic Liberation Front, which had previously battled with security forces in the town in recent years.